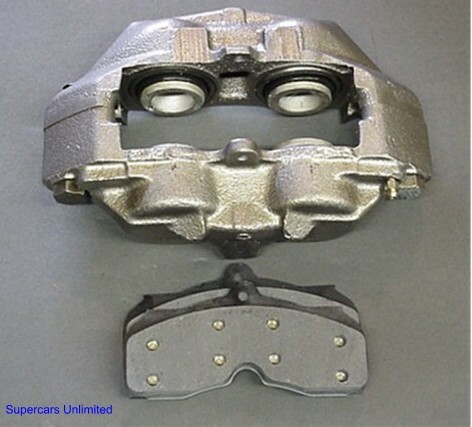 For cars with front DISC brakes. Calipers are complete rebuilt assemblies. Units include premium pads, all mounting hardware and guide pins. 100% pre-tested for problem free performance. All calipers are sold on an exchange basis. Core "Deposit" listed below product listing. Cores with broken housings cannot be accepted. Be sure to drain all fluid before returning core. Calipers must be returned in original box(es). For more Core Deposit information, see ordering and policies section. All models. Rebuilt with stainless steel sleeves in all four bores to totally eliminate the leakage problem common with this caliper design. CORE DEPOSIT for 06-138 caliper. CORE DEPOSIT for 06-140 caliper. CORE DEPOSIT for 06-142 caliper. CORE DEPOSIT for 06-144 caliper. CORE DEPOSIT for 06-146 caliper. CORE DEPOSIT for 06-148 caliper. CORE DEPOSIT for 06-150 caliper. CORE DEPOSIT for 06-152 caliper.